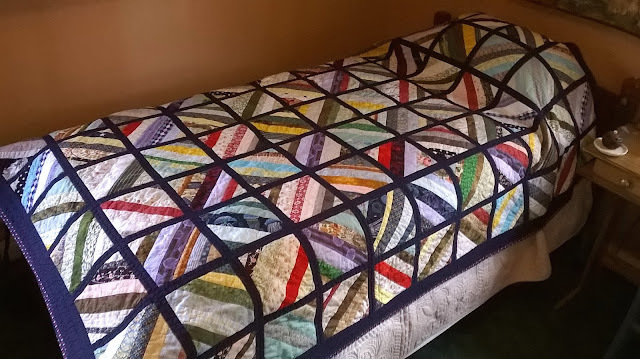 This week it's a finish for the twin-size scrappy bed quilt (65" x 88") originally meant to go to The Center for Women and Families here in Louisville. This is actually an extra-long twin bed. Just realized I didn't take a photo of the back, which was pieced from four fabrics. It turns out that Project Linus needs it more. So next week this will go to Among Friends Quilt Shop, one of four local collection points for donations. I wonder, in the five years between the inception of Project Linus and the death of Peanuts creator Charles Schulz, did he ever learn of Linus's part in this wonderful foundation? I hope so. Moving on. Fabrics have been chosen for the next triple-arch window quilt (using the upper half of the autumn forest panel shown in the last blog post). My favorite dry stone wall fabric, also used in The Visit and The Tower. This will be the main wall. A different dry stone wall fabric. This will be the inner arches and sills. The arches will be framed in the same mottled black fabric used in Villa with a View, pictured a few blog posts back. So, not a whole lot of progress, but it's a start. Happy spring! Or autumn, depending on your hemisphere. Someone's going to love that scrappy quilt. Bless you. I'm curious about the quilt under the Linus quilt. Fabric choices do take a while. Took me a whole evening to pick fabrics for (4) 3 1/2" units of a block - sigh. Welcome, Spring. Comment moderation has been enabled merely to prevent spam. Your comment should show up within a day or two. Thank you for your patience.